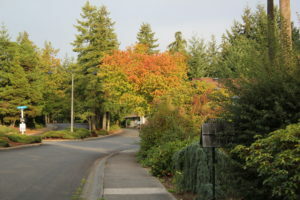 Huntington Park, an affordable active adult community, is located near Puget Sound in Des Moines, Washington. If you’re looking for a community where you can pursue your retirement plans you should visit Huntington Park. Under HUD guidelines, residency is age restricted. At least one resident in each unit must be age 55 or over. Some exceptions may be permitted. All residents must be at least 18 years old. Huntington Park is comprised of 32 duplexes, 24 triplexes, 17 condominium units, and 187 single family homes. Your realtor may be able to provide the current listings. A clubhouse and pool provide the center for many activities including business and recreation. Greenbelts provide open space and privacy with over one mile of trails for your walking pleasure. Active adult community, home owner association, common interest property, over age 55 housing, or by any other name, Huntington Park offers a lot. Located in south King County with easy access to Sea-Tac Airport and I-5 is great for travelers. RVers and boaters will appreciate the recreational vehicle storage lot. Check for availability. A modest fee applies. The Des Moines Marina and Redondo boat ramp are nearby. Residents enjoy the numerous waterfront parks in the area. Active adult community is perhaps the most appropriate description as Huntington Park offers many opportunities to socialize and participate in events. Being self-governed provides other forms of activity such as participation in the operation, management, or maintenance of the common interest property. Volunteers, along with the staff, are critical to the success of Huntington Park. Thank you for visiting our Web site. If you would like more information about Huntington Park please call 206-878-2744. You can also contact us at our e-mail address: emilyb@huntingtonparkwest.org.